Light Sport Aircraft (LSA) were once on the rise, but have struggled lately to maintain the stamina that existed when they first entered the market. Still, pilots today can earn a sport pilot certificate in a light sport aircraft for less money and in less time than a traditional private pilot license. These smaller aircraft are also less expensive and easier to operate than the typical flight training aircraft of the past. So why aren't they very popular? Standard Category/Sport Pilot-Eligible: Pre-existing aircraft the happen to meet LSA requirements and can be flown by sport pilots. S-LSA: Special light-sport aircraft are factory-built aircraft specifically designed for the LSA standards. S-LSAs meet ASTM (American Society for Testing & Materials) consensus standards and are ready-to-fly when sold. They can be maintained by a standard A&P mechanic or a repairman with an FAA LSA maintenance rating. E-LSA: Experimental light sport aircraft are sold as kits, and can be built at home in accordance with the manufacturer's manual and instructions. E-LSA manufacturers are also ASTM-compliant. E-AB: Experimental amateur-built aircraft are not all also categorized as light sport aircraft. But a light sport aircraft can be classified as experimental amateur-built. E-AB aircraft are homebuilt aircraft, and if they meet the LSA design and performance requirements, can be flown by sport pilots. Since E-AB aircraft involve more extensive home-building than an E-LSA, the aircraft is restricted to personal use and cannot be used for flight training (with the exception of the aircraft owner himself) or rental. 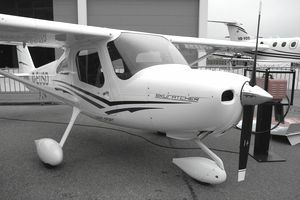 Examples of light sport aircraft include the Cessna 162 Skycatcher and the Terrafugia Transition. Any person who has been denied an aviation medical certificate in the past is not eligible to use a driver's license to establish medical fitness for flight. If denied an aviation medical, you must apply for a waiver or a special issuance medical, which must be approved before flying as a sport pilot. Previous or current pilots who have let their medical certificate expire can use a driver's license to establish medical eligibility for sport pilot privileges, as long as they have never been denied a medical certificate. Finally, for any certificate or rating, a pilot is required to assess his or her own fitness before flying. Thus, the FAA states that a person with known medical conditions that could interfere with flying duties is not eligible for a sport pilot certificate unless that person successfully attains a valid aviation medical certificate. So why are light sport aircraft less popular than industry players expected? Perhaps because of all of the restrictions involved. Many who begin flight training as a sport pilot quickly recognize the value that a private pilot certificate offers and they switch to traditional private pilot training. Or perhaps the industry just underestimated the number of pilots who would take advantage of being able to fly without a medical. Either way, the light sport aircraft industry sort of fizzled out in recent years.